Published on 04. 03. 2013 in hype & linkage and pictorial arts. 13 Comments Tags: Burlington Magazine, Titian. Above is a detail from a drawing that I’ve published in the new issue of the Burlington Magazine as by Titian. Not many drawings by the master is known, so this is a rare occurrence. I’m convinced that it’s by him, but am interested to see and hear what others think. So, if you’re interested, do look up the article. 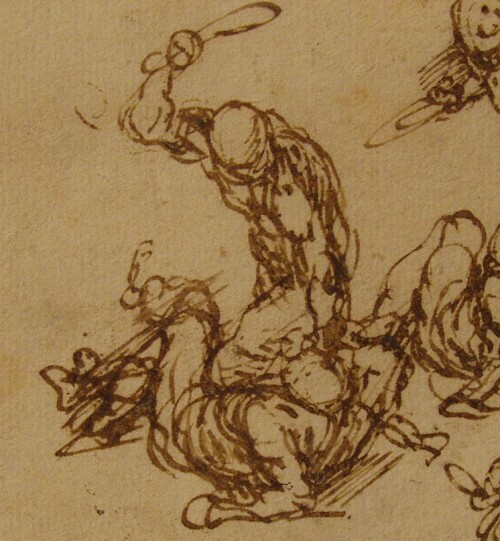 The drawing was brought to my attention by George Goldner of the Metropolitan Museum in New York with words to the effect of “want to see a new drawing by Titian?” Needless to say, I am very grateful that he did. Could it be by Andrea Chiovane (1510-1563) ?? Interesting suggestion. I obviously don’t think so — Schiavone’s drawings, as I understand them, are less forceful, more fluid, at times almost diffused. But I’d be interested in what makes you think of him in this context! Ah, the Pitti painting, yes. It does indeed make use of the same figural arrangement, as does Veronese’s Caen St. Anthony, as I point out in the BM article. I also to the figures at the far right of this design by Baccio Bandinelli as the possible protoype. 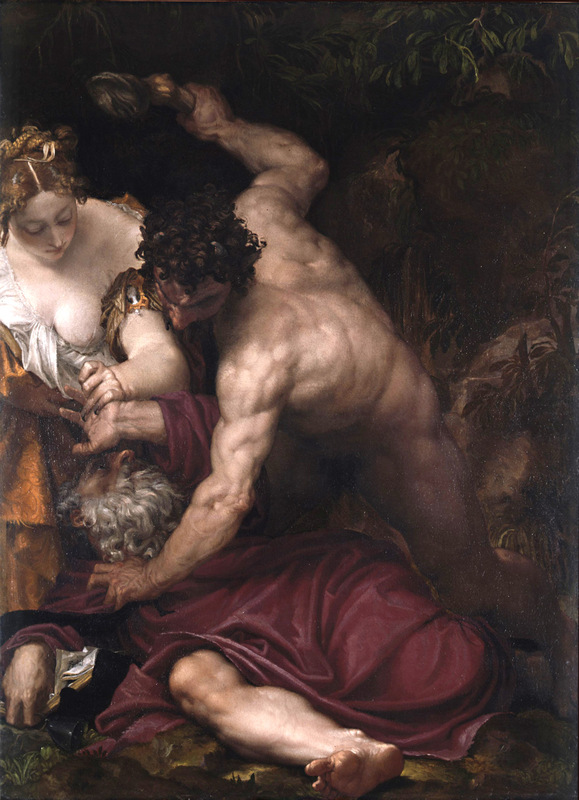 I suspect that both Schiavone and Veronese are indebted to Titian, possibly via Bandinelli, here. In any case, I don’t think the present drawing looks like Schiavone’s confirmed works, while it does look like Titian’s confirmed sheets. I raise a white flag , you wine . No, seriously, I very much appreciate your input. I think the Pitti painting deserves greater consideration in general, but also in this particular context. While I’m quite convinced that the drawing is by Titian, there’s much there still to be understood, not only as to its dating, but also to the geneology of the figural arrangement. So thanks! Could I solicit your help / input with an early 16Th. Century Baroque painting related to this sketch . It had been an anegma to a lot for long. I would like to use your personal email address not the public one , should you agree. Sure, you can find my email is in ‘contact’ above. Thanks, I’ll email the information and image this weekend . Yes, I can email it. Please email to my email address and on Saturday morning I’ll email photos and information . I sent the info. Last Saturday and I wonder if you have seen it.